Cockhill Celtic players and supporters celebrate after their win in Saturday night's Donegal News League Cup Final. Laurence Toland came off the bench to fire Cockhill Celtic to victory in Saturday night’s Donegal News USL League Cup Final at Maginn Park. The Ramelton man scored twice after coming on as a 66th minute substitute as the Inishowen men got the better of Letterkenny in another closely fought contest. Having lost twice against their cup final opponents in their last two games, Cockhill will be delighted with this victory. And on their second half performance alone, they just about deserved the win. Toland’s two goals were very well taken and they came either side of a wonderful Malachy McDermott strike which more or less sealed the deal, making it 2-0 on 78 minutes. Letterkenny pulled a goal back right at the end when another substitute, Odhran McMacken, finished to the net from close range. But it was little consolation for Letterkenny on a night when Cockhill claimed a sixth league cup success in a row. This game came just four days before the two sides meet in a league title play-off on Wednesday night. So with that in mind, it was probably no surprise to see changes in personnel in both camps. That said, neither team was in anyway weakened by those changes, and the first half was to prove a close affair with only McDermott and Rovers player Luke Nelis going close to breaking the deadlock. 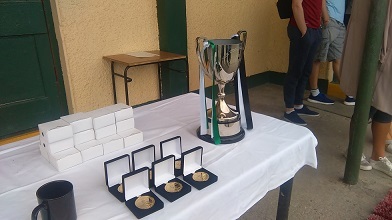 The cup and medals wait to be presented at Maginn Park, Buncrana. The introduction of Toland on 66 gave Cockhill extra spark in attack and he put them in front on 70 minutes when he made room for himself by shaking off Ryan McConnell’s challenge before expertly lifting the ball over the advancing Rory Kelly to find the net. Seven minutes later, McDermott struck a second, driving the ball into the top corner from outside the box after Rovers had only half dealt with a set-piece. In a feisty encounter, there were a number of bookings issued. But Cockhill put the game to bed when Toland scored their third on 87, racing from inside his own half when Rovers had pushed almost everyone into attack, and striking the ball past Kelly. McMacken turned home a consolation goal in injury time for Letterkenny who ended the game with ten men when David Shovelin was shown a second yellow card following a late challenge on Gerry Gill. Letterkenny will now have to dust themselves down and go again for Wednesday night’s winner-takes-all title decider at Dry Arch Park, Bonagee. Cockhill Celtic: Gavin Cullen, Mickey Doherty (Ryan Kelly 76), Jason Breslin, Peter Doherty, Oisin McColgan, Liam O’Donnell, Malachy McDermott, Gerry Gill, Gerard McLaughlin (Laurence Toland 66), Mark Moran (Jimmy Bradley 84), Ronan Doherty. Letterkenny Rovers: Rory Kelly, Ryan McConnell, Chris Flanagan, Conor Tourish, Paul McVeigh (Garbhan Grant 79), David Shovelin, Kevin McGrath, Cillian Morrison, Declan Sharkey (Steve Okakpu Emeka 64), Christy Connaghan, Luke Nelis (Odhran McMacken 59).